Some children have weak muscle tone in their hands. This can be caused by a number of reasons such as neuro-muscular defects, injuries at birth, Global Development Delay and Autism Spectrum Disorder. It is important that children are exposed to a variety of fine-motor activities to help develop good hand strength. 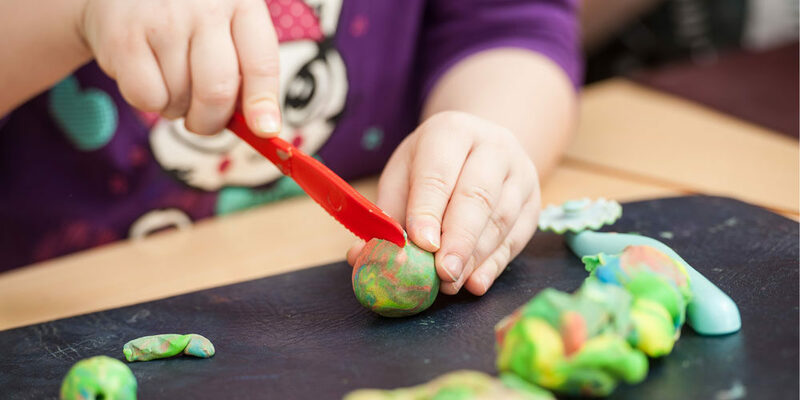 These activities are vital to further develop and refine a child’s fine-motor manipulation, finger isolation, eye-hand coordination and bilateral coordination skills. Paper Crumpling – Have your child crumple up pieces of scrap paper or newspaper into the tiniest of balls. Then have them try and crumple up the paper using just one hand at a time. Masking Tape – Stick strips of wide masking tape to a table and have your child peel and pull the masking tape and then encourage them to crumple into a small ball. You can incorporate a throwing and catching game once you have created a large ball from it. Squeezing Sponges – You can use sponges during bath time, while washing the dishes or during a painting activity. Encourage your child to squeeze the water or paint from the sponge. Play Dough – Have your child roll, pound, pull, squeeze and poke the play dough. You can also try hiding small toys, coins, buttons and beads in the play dough and have your child find them.